Sometimes playing online chess gives me some satisfactions. I only play 5-minute chess, but five minutes (times two, five for each player) are a looong time, during which adrenalin flows free in my veins. Chess is a drug: these 5-minute games are addictive, exhilarating, and damaging to one's ego at times. But when things go the right way, it really feels good. Today I was paired with a Mongolian international master, IM Myagmarsuren, by the automatic pairing system of 5-minute blitz games on the ICC. Here is the game, with minimal commentary. 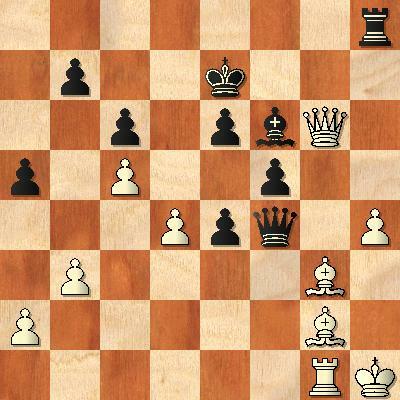 The opening has led to a position where both White and Black are unsure where to put their kings. If black castled kingside, white would be very happy to do the same, and then enjoy the spatial advantage the opening provided him with. 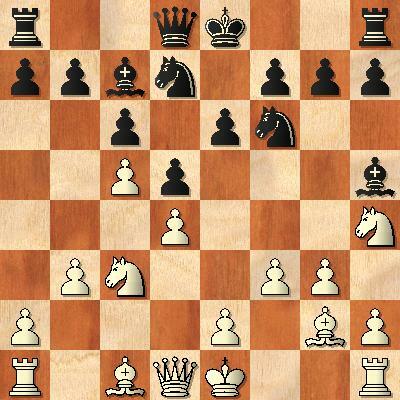 But if white castled without waiting for black's decision, a natural attack could develop. So here come a few waiting moves, uncharacteristic of blitz play, where both players try to understand the opponent's plan. Also note that in this position probably white realized that his original idea of g4 (to chase the bishop and exchange it for the Nh4 would fail due to Nxg4! 11. f4 a5 12. h3 h6 13. Qc2 g5! I decided to go all in for a kingside attack. Here I speculate on the fact that white cannot take the pawn, since 14. fxg5 runs in 14. ... Bxg3+ and 15. ... Bxh4. The move is ambitious, since it opens the kingside for action by both sides. Here, 14....Bg6 followed by Nh5 would have brought the advantage to black. 15.gxf4 Rg8 16. Kf2 Bg6! The best move, according to Fritz. But here 17. ...Bf5 would have been better. 18. e3 Nh5 19. h4 Ke7?! I was very satisfied with this move as I played it. 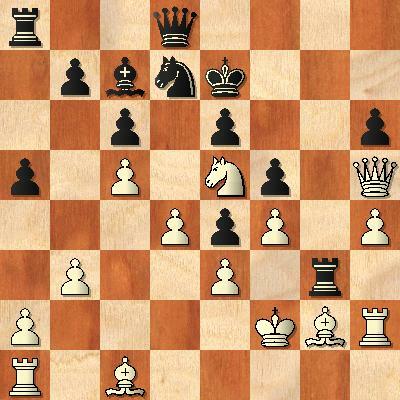 The idea is Rxg2+ and Qg8+, with an invasion on the white kingside. However, according to the computer this squanders part of my advantage. 19....Qf6 was better. Believe it or not, I had not seen this! However, my position is good enough that I can continue to fight -in normal conditions this is a quick loss for black, but we both have less than 90 seconds to finish the game, and in such case the player who attacks has a significant bonus. Nxh2 28. Kxh2 Bf6 29. Qh5 Qg7! Calmly preparing to invade. White has still a winning position, but it is not that easy any longer. And here it is, a few slightly imprecise moves by white are enough for black to equalize, even a rook down. 31.Qe2 was the only winning move by now. From here on, both players are really short of time - I had about 20 seconds left, and my opponent had no more than 40. Given this, the moves of the game are of surprisingly good quality. 35. ..., Qxf4 36. Bg3? A mistake. Now black should win. Rxh4+! 37. Bh3 Rxh3+ 38. Kg2 Qh6? With just 15 seconds on the clock, I err. Exchanging in g3 twice leaves me with a won ending. 39.Bd6+ Kd7 40. Qf7+ Kd8 41. Qc7+ Ke8 42. Qc8+ Bd8 43. Kf2?? The final blunder. Now it's over. 43. ..., Qd2+ 44. Kf1 Rf3# with just 4 seconds left on my clock. And there goes IM Myagmarsuren (shatar on ICC), who is most famous for a loss with Robert James Fischer. Bobby won in 31 moves his game, so he beat me by 13 - but he was playing white back then!